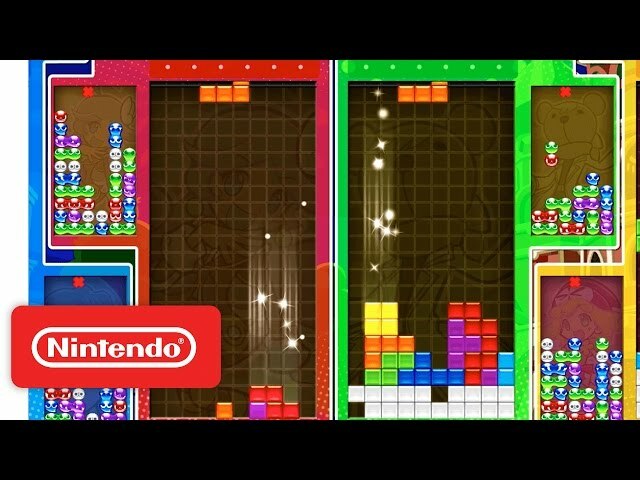 Puyo Puyo Tetris (game, 2014). A puzzle video game by Sega JP/NA, Deep Silver EU/Sega Of America, Inc. Developed by Sega, Sonic Team. Official Trailer. Puyo Puyo Tetris is a puzzle video game by Sega JP/NA, Deep Silver EU and Sega Of America, Inc., developed by Sega, Sonic Team. 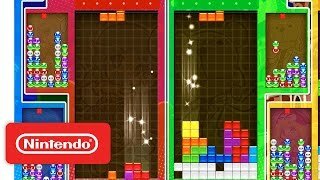 Puyo Puyo Tetris - Official Nintendo Switch Trailer. Puyo Puyo Tetris centers around the combination of two main gameplay styles, Puyo and Tetris. In the Puyo Puyo style, colored blobs known as Puyos will fall from the top of the screen and can be rotated before being placed down. The Puyos can be popped by matching four and more of the same color next to each other. By carefully arranging the Puyos, players can perform chain combos in which additional Puyos are matched and popped as they fall into place, earning more points as a result. The Tetris style, on the other hand, has players placing shaped blocks known as Tetriminoes down on the playing field. Successfully filling a complete horizontal line of blocks on the field will make it disappear, and additional points can be earned clearing multiple lines at once. In either style, the game ends if Puyos or Tetriminoes pile up over the top of the playing field. Using these two gameplay styles, Puyo Puyo Tetris features five main game modes, each of which can be played with up to four players, both locally or online, or against computer opponents. With the exception of Swap and Fusion modes, each player can independently choose between Puyo and Tetris styles. Versus mode is a standard match in which players face off against each other with their chosen style. By performing chain combos in Puyo style or clearing lines in Tetris style, garbage is sent over to the player's opponents, which appears as Garbage Puyos in Puyo style and added lines in Tetris style. Players lose once their playing field is filled over the top. Party mode throws in power-ups that can give the player benefits or hinder opponents. The player who has the highest score at the end of a time limit wins, and players won't be eliminated from filling up the board in this mode. Swap mode has the players periodically alternate between Puyo and Tetris styles, each on its own board. Players lose when one of their board becomes completely filled. Fusion mode combines both Puyo and Tetris styles onto one board, with Tetrinimoes sinking below any Puyos when placed. Finally, Big Bang mode combines Fever mode from Puyo Puyo with Lucky Attack from Tetris. Depending on the style, players must quickly clear waves of pre-arranged Puyos or Tetris blocks, aiming to clear as many waves as possible within a time limit. After each time limit, players are dealt damage depending on how much slower they were against the leading player, with players eliminated if they run out of health. There is also an Adventure story more campaign consisting of various battles against computer opponents and mode-specific challenges, and six single-player Challenge modes; Endless Fever, Endless Puyo, Tiny Puyo, Sprint, Marathon, and Ultra. Playing through each mode earns credits that can be spent in an in-game shop to unlock different art styles for Puyos and Tetriminoes and alternate voice packs. Puyo Puyo Tetris centers around the combination of two main gameplay styles, Puyo and Tetris. In the Puyo Puyo style, colored blobs known as Puyos will fall from the top of the screen and can be rotated before being placed down. The Puyos can be popped by matching four and more of the same color next to each other. By carefully arranging the Puyos, players can perform chain combos in which additional Puyos are matched and popped as they fall into place, earning more points as a result. The Tetris style, on the other hand, has players placing shaped blocks known as Tetriminoes down on the playing field. Successfully filling a complete horizontal line of blocks on the field will make it disappear, and additional points can be earned clearing multiple lines at once. In either style, the game ends if Puyos or Tetriminoes pile up over the top of the playing field. Puyo Puyo Tetris was scheduled to be released by Sega JP/NA, Deep Silver EU and Sega Of America, Inc. on February 6, 2014, on December 4, 2014, on March 3, 2017, on April 25, 2017, on April 28, 2017 and on February 27, 2018. This video game is available for the following platforms: Nintendo 3DS, Wii U, PlayStation Vita, PlayStation 3, PlayStation 4, Xbox One, Nintendo Switch, Microsoft Windows.